A fantastic blog by my close friend, Sarah, recapping a wonderful BBQ hosted by her and her sister, Mardi, last Sunday. Sundays nights in our household have become a routine of returning from sweating off the weekend at the gym, having a quick shower then sinking in to some well cooked steak and a few shared salads. Having acquired two additional carnivores in the house (my protein-fiend plus the twin’s PT boyfriend), the purveying of red meats has become somewhat of an art form in our family. The recent addition of a new barbecue, plus the warmer weather means that Sunday Steak nights are well and truly, here to stay. 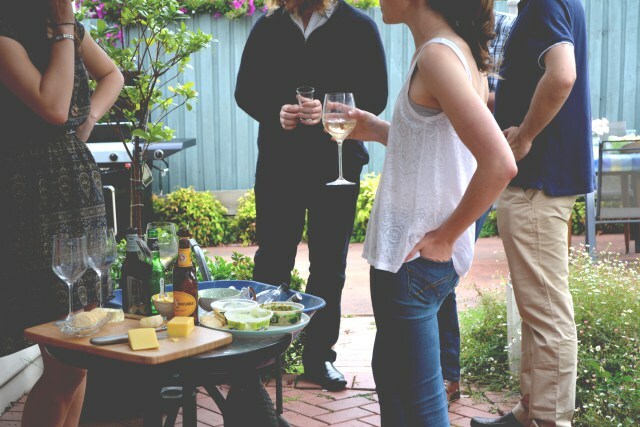 This past Sunday night, we had some country friends return from out of town – so what better opportunity to christen the new grill than with some catch-up drinks, conversation and weekend wine-down. We used to do these kind of catch-ups when we were back in Year 11-12. We would have frequent ‘pizza nights’, rotating houses and using it as a cheeky escape from our school homework.